The world’s most massive living organism, a natural mesh network, is endangered. You can help save it. The world’s most massive living organism and a natural mesh network, is endangered. You can help save it. The western aspen is a silver-trunked tree, famous for the brilliant golds and reds its leaves take on in early autumn. Commonly found at higher altitudes and latitudes across North America, it is also known as the “quaking aspen” or “trembling aspen” because of the way its round, flat leaves quiver in the mountain wind. To an untrained eye, the Pando Aspen Grove in central Utah might look like a normal forest. In fact, the trees of the Pando Aspen Grove, are all a single organism. Every “tree” in Pando is actually a stem — sprouted from the same sprawling, underground root system, which scientists believe has been asexually reproducing for thousands of years. 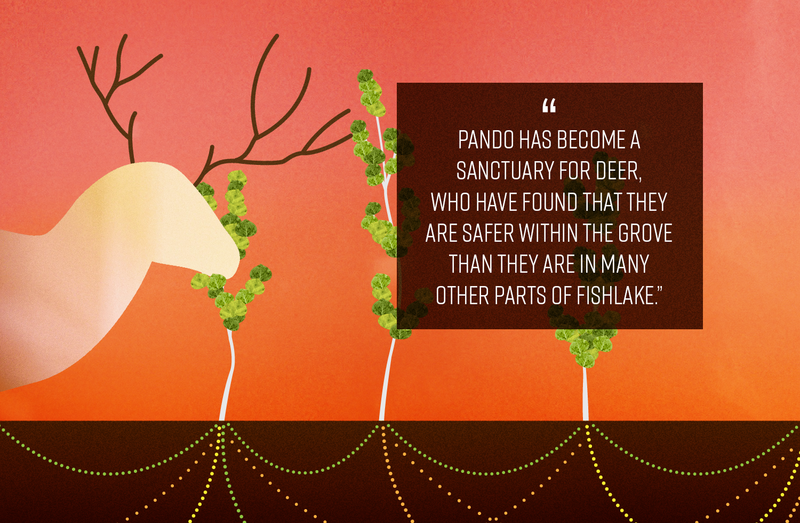 Pando is made up of approximately 47,000 individual shoots, covering 106 acres. Scientists estimate that the entire clonal colony clocks in at over 6,500 tons. At 13 million pounds, it weighs as much as 43 blue whales — making it the earth’s most massive living organism. “Pando is a giant aspen clone, meaning that all of the stems are genetically identical,” says Paul Rogers, an ecology professor at Utah State University in Logan, just a few hours north of the Pando Grove. Rogers explains that Barnes was able to establish Pando’s singular identity by using leaf morphology and other physical traits. In 2008, USU geneticist Dr. Karen Mock and her colleagues performed a series of genetic tests confirming that Pando is in fact, one organism. Rogers has been researching Pando for many years, and is also the director of the Western Aspen Alliance, a “science sharing” group dedicated to aspen groves and the ecosystems they sustain. “Aspen forests contribute an inordinate amount to biodiversity. For the plants and animals dependent on these forests, aspen are very very important,” he says. Some have claimed that the Pando is not only the largest living thing on Earth, but the oldest as well, estimating its age as high as 80,000 years, though Rogers is skeptical. The problem, as researchers like Rogers and his colleagues have documented, is that there are very few suckers and young trees left in Pando. If you visit Pando today, you will see that most of the trees are fully grown. Without new suckers to replace the old trees as they die, Pando’s millennia-long run could come to an abrupt and tragic end. So what is killing Pando? The working hypothesis is deer and cattle, mostly. Livestock is an important part of Utah’s economy. According to census data, the sale of cattle and calves is the the largest component of Utah’s agriculture market, and accounts for 20 percent of market value in the state. Ranchers regularly bring their herds to graze in Fishlake National Forest, passing through Pando for a few weeks out of the year. Cattle grazing has an impact on the grove’s ability to regenerate. But Utah ranchers have been allowing their livestock to graze in the area for generations, and doesn’t fully explain Pando’s decline. As Rogers explains it, deer have been feeding on Pando’s suckers at higher rates in the past few decades than they have historically. These animals eat the nutritious young sprouts before they have the opportunity to grow into mature trees. This process has left a colony of only mature trees, with no new ones to take their place. The deer problem is the result of complex political and economic factors. Although Fishlake National Forest is on federal land, deer populations are managed by the state. The Utah Division of Wildlife Resources makes the majority of its revenue from the sale of hunting and fishing licenses and permits, according to a 2010 report. The state has an economic incentive to sell more hunting licenses, Rogers says, which means making sure there is enough game for hunters to be successful and want to return next season. Artificially bolstering the deer population is one way to ensure more happy hunters. Utah doesn’t allow hunting near roads, and because there is a road running through the middle of Pando, no hunting is permitted in the grove itself. This has made it something sanctuary of a for deer, as they are safer within Pando than they are many in other parts of Fishlake’s 1.5 million acres. If humans created the problem, then humans might be able to fix it. The Western Aspen Alliance is actively working to do just that. The WAA is a joint venture between Utah State University’s College of Natural Resources, USDI Bureau of Land Management, and the USDA Forest Service Rocky Mountain Research Station and National Forest Systems. They research scientifically sound conservation methods, and bring that research into land-management and policy discussions. While fencing alone does not protect resourceful deer from getting access to the aspen suckers, early success with this technique has been encouraging. Some have estimated the cost of fencing the entire 106-acre grove could be as low as $60,000. “We’re actively trying to advocate science-based management decisions, but we need money to support that,” says Rogers. 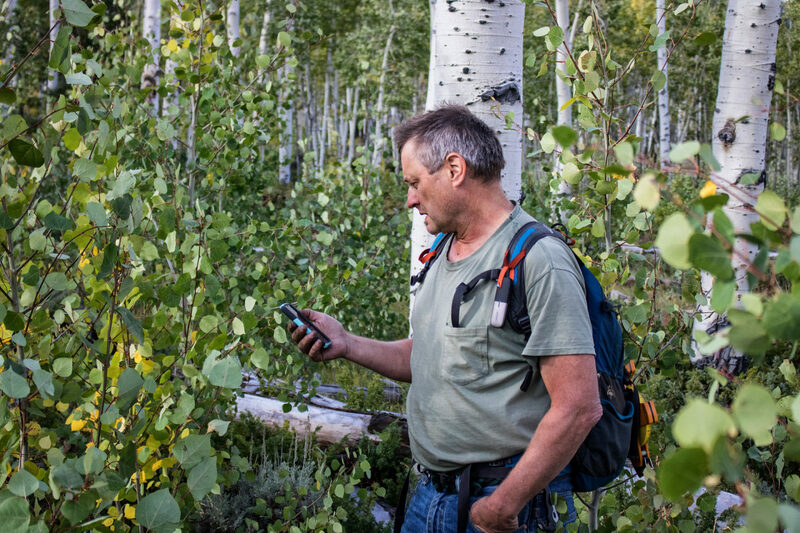 The goTenna’s Mesh For Mesh campaign has ended, but you can still get involved by supporting the Western Aspen Alliance in their efforts to protect Pando.